These days, I seldom have dessert--or at least compared to my regular dessert-wholfing habits. If you know me at all, you know that I basically live for dessert, which is why cutting it out of my diet (for marathon training purposes) has been so hard. It's been more than three months of intense training and I have yet to go a full week--maybe even a day--without a bite of some kind of sweet. People said there's fruit; people said I'd get used to fruit as dessert. People said--and continue to say--a lot of nonsense. No I haven't gotten used to eating fruits as dessert and no I haven't abandoned dessert altogether (nor will I in the remaining week and a half of my training). 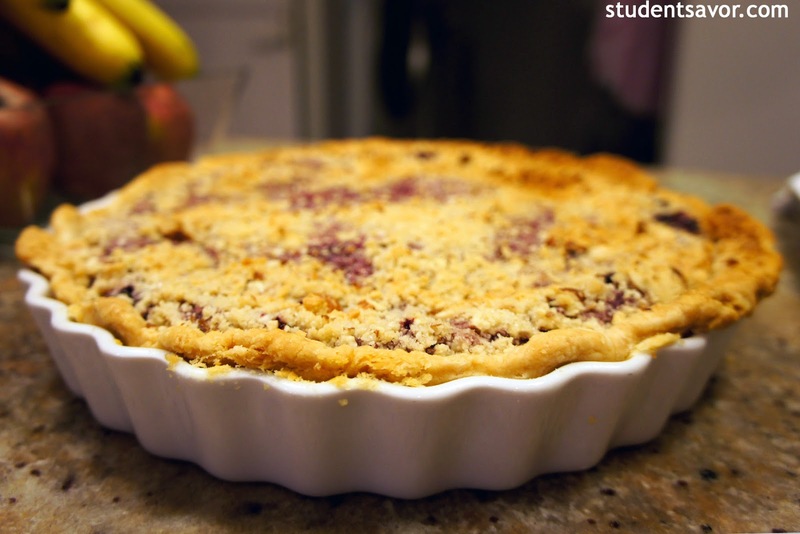 What I have done, is create scrumptious fruit-based desserts to satisfy my sweet tooth. This one in particular was a friend's request. 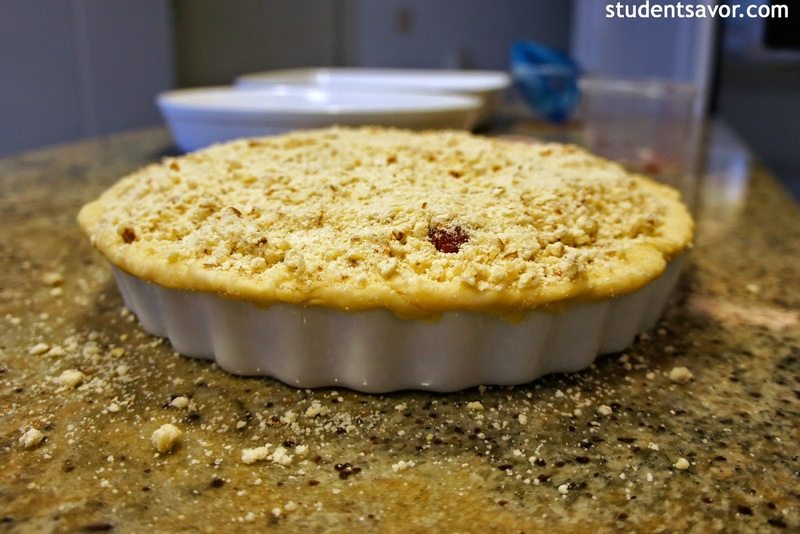 It turns out my mom's variation of this raspberry crumble from six years ago turned into an all-time favorite. And even though this was my first time making it, baking it once is enough to vouch for the taste and easiness of the recipe. Pulse flour, butter, shortening and salt in a food processor (or mix with your fingertips) until mixture resembles coarse meal with small pea-sized lumps. Transfer 2 cups mixture to a bowl; and reserve the rest. Drizzle 4 tablespoons ice water evenly over the 2 cups mixture; stir gently with a fork until incorporated. Squeeze a handful of dough, if it doesn't hold together, add more ice water (1/2 tablespoon at a time), stirring until incorporated. Be careful not to overwork dough or pastry will be tough. Turn out dough onto work surface and divide into 4. With the heel of your hand, smear each portion once or twice to help distribute the fat. Gather all dough with pastry scraper and press into a ball, then flatten into a 5-inch disk. If dough is sticky, dust lightly with additional flour. Wrap dough in plastic and chill until firm, at least 1 hour. To make topping, add almonds and sugar to remaining dough mixture and rub together to form some large clumps. Set aside. Place a large baking sheet on the lower third rack of the oven and preheat to 375F. On a lightly floured surface, roll out disk dough into a 13-inch circle. Fit into tart pan and trim excess dough, leaving a 1/2-inch overhang. Fold overhang under pastry and press against rim to reinforce edge. 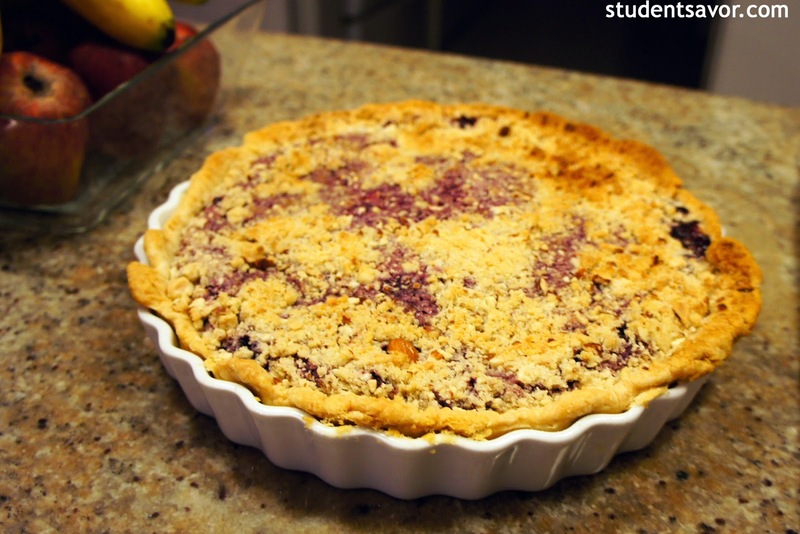 Fill pie shell with berries and sprinkle evenly with topping. Place tart on the baking sheet and bake until topping and crust are golden and the filling is bubbling, about 1hr. Loosely cover with a foil sheet after 30 minutes to prevent dough over browning. Cool in pan on a rack 30-40 minutes and serve warm.